Several years ago, a friend of mine from church told me about this cool travel club she joined. Of course I love to travel AND save money on that travel, soooo I was open to hearing how it all worked. Well, the Lord used that little decision to join the club to change my life. We went on a cruise (the first real vacation after our honeymoon!) and met some super cool people. I had such a great time that I started attending some of the personal development events they offer. I learned so much about myself and more about the people and heart behind the club, especially the non-profit they support called the WorldVentures Foundation. So many cool projects they were doing and all of them were benefitting children around the world. "Creating positive change for children world-wide." A couple of years later, I donated a hand-painted ceramic plate to the annual silent auction. The intern at the time loved it so much someone bought it and gave it to her! She called to tell me this cool story and I was able to share some ideas for helping them raise funds, of course, with apparel. At the time they had the logo on shirts, but that was telling the end of the story, not encouraging anyone to ask questions or create curiosity. Soon I had a meeting with them! I prepared a few ideas but also showed them a drawing I sketched just before the meeting. 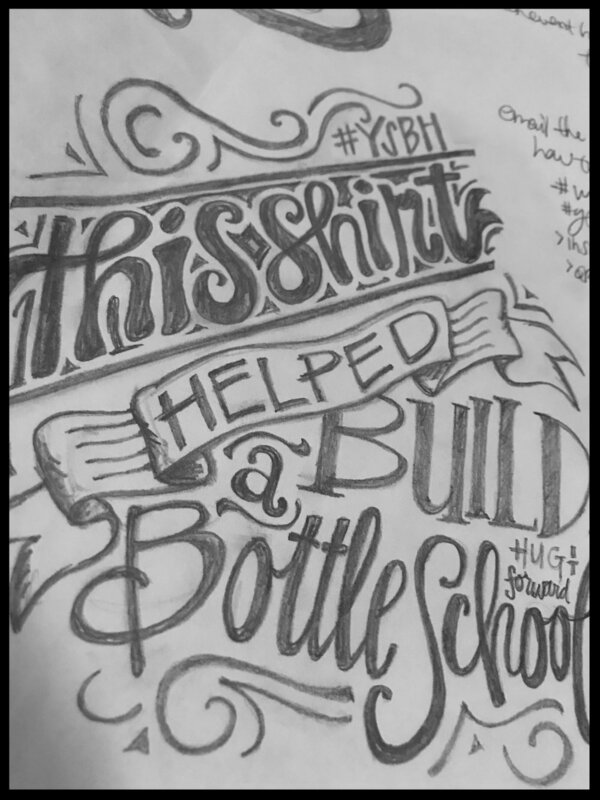 "This shirt helped build a bottle school." Two weeks later we were offering that design on three different shirts at an event! They were a hit and the shirts sold out! I was so excited and humbled that it went so well. A beautiful partnership was born. This was the start of an ongoing apparel campaign: Have a nice shirt with a design that invited people to have a conversation. Something special that allowed the wearer to share an idea they were passionate about, knowing they were a part of something that was impacting others around them. Not everyone can donate thousands of dollars, but we could raise thousands by people getting behind an idea. And it worked! People would say, "That's a cool shirt. What's a bottle school?" and we got to share about the incredible Bottle School projects in Guatemala. My family was able to go on a Bottle School trip. The impact they saw from the work they did is forever on their hearts and in their memories. They saw first-hand how important this work is and by helping the country improve education, they were truly changing generations! So a shirt didn't just have a logo or a drawing, it represented an experience. Soon the WVFoundation asked me to join them on a planning meeting to come up the next design. What a cool opportunity to continue to share my ideas and have input on the merchandise they would be selling at the next event that summer. The meeting was really fun and we came up with the word "Voluntourist" based on the WVFoundation's special trips they call "Voluntours" where members can use their vacation time to serve in some way. Many Voluntours consist of building bottle schools with Hug It Forward like what my family did but all of them are planned, safe, and serving children by impacting communities through ongoing projects and partners. After that meeting, we had a plan in place: use high quality shirts, a custom and unique design that starts a conversation and allow it to support the work of the WVFoundation and their partners' work. The Voluntourist word didn't have a definition so they let me run with it! So fun! 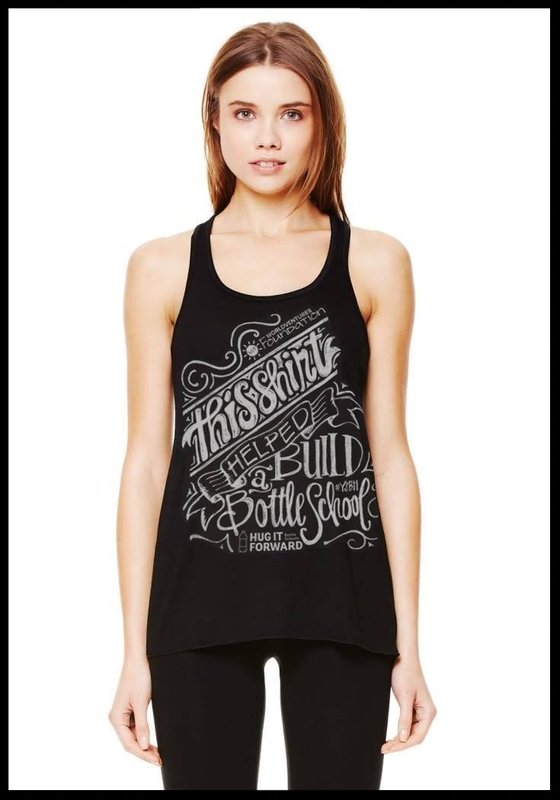 I used my handwriting to create the design and used the idea of a definition for the shirt. We started with Bella+Canvas heather gray v-neck shirts and a bright yellow print. Again, the shirts were something people looked forward to buying so we kept at it. 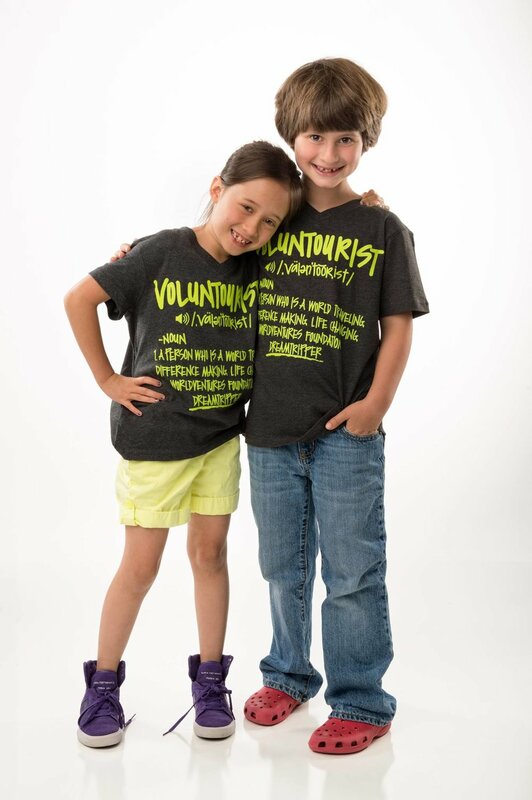 We decided to offer the Voluntourist shirts in tank tops, too and this time with a gunmetal metallic print. What is humbling and exciting is this design is on people all over the world. We continue to print these shirts. I think my favorite has to be the pink glitter!